Sometimes within one set of icons, we have icons that look alike and it is very hard to understand what is what. If you miss the legends, you can very easily get the icons mixed up. 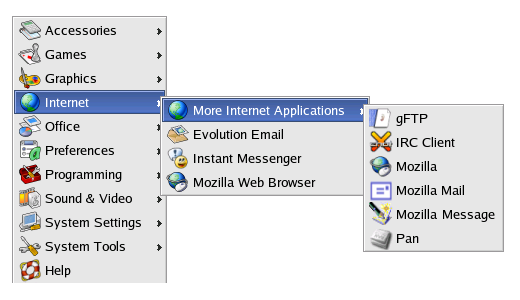 Icons from the Utilities section in Mac OS X. I am always getting them confused and launching the wrong application. The problem is aggravated by having small size icons displayed on screen. The simpler and more laconic the icon, the better. It is preferable to keep the number of objects in a single icon to a minimum. Each icon presents us with a mini-story with an intertwined plot. The problem is that in small size you are unable to work out what is depicted. Even in larger sizes, it is not always that easy to decipher the icons. An icon should be easy to read. The fewer elements it has, the better. It is better if the whole image is relevant and not only part of it. Therefore, you have to pay attention to the context of using icons. At first glance everything looks alright. The sense is not lost here but the icons become much more discernible. Ticks here are absolutely superfluous. By the way, why are they done in red? It is a unity of style that unites several icons into a set. The uniting property can be any of the following: color scheme, perspective, size, drawing technique or a combination of several such properties. If there are only a few icons in the set, the designer can keep some rules in his head. 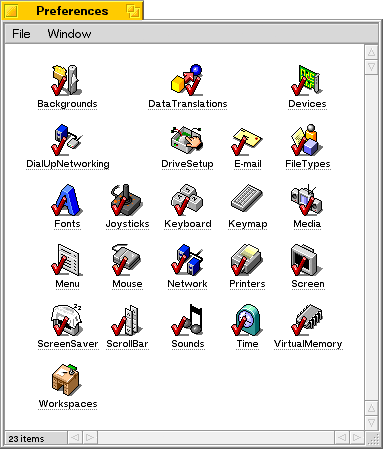 If there are many icons in the set and there are several designers working on them (for instance, icons for an operating system), then special instructions are created. Such instructions describe in detail how to draw an icon so that it fits straight into the set. A multitude of styles in the shell32.dll file in Windows XP. This is the default set of icons suggested to a user wishing to change an icon. Progress does not stand still: interfaces have gained the potential to display semi-transparent objects, lost the limitation on the number of colors and there is now a trend towards 3D icons. But is it really all that useful? Not always! Especially if we are talking about icons sized 16×16 or smaller. Perspective in icons of such minute size is unnecessary and even counter-productive. 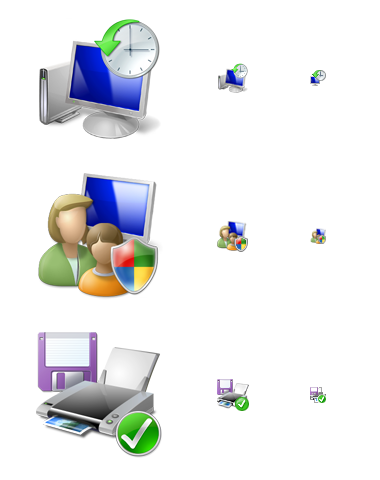 As standard, icons in Windows XP are given a two-pixel black shadow; but in 16×16 size the shadow appears too large and makes the icons look dirty. The Address Book icon looks especially bad in this set. Selecting what is to be displayed in an icon is always a compromise between recognizability and originality. Before a metaphor (image) is developed for an icon it is wise to see how it is done in other products. Maybe the best solution lies not in coming up with something original but rather in adopting the existing solution. 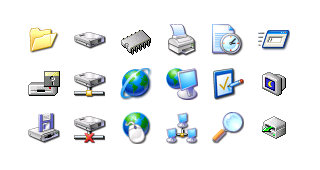 An example of excessive originality is the bin icon in OS/2 Warp 4, which is not actually a bin at all but a shredder. Another problem with choosing a shredder is that there is no one well-known type of shredder out there. The icon appears very much like a printer with an octopus hidden inside. What is more, it is absolutely unclear how a full bin would be displayed according to this metaphor. Let us suggest that we need to draw an icon for working with e-mail. It makes perfect sense to use a metaphor of real paper mail. A mailbox for example. These images are courtesy of the Wikipedia article entitled Post box. 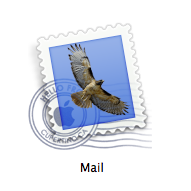 The idea of using a stamp is great but the use of the eagle red-tailed hawk image is definitely questionable. You reach out to click on the radio button but end up clicking the whole icon! Pay attention to the Previous and Next buttons, a rare type of button with legends underneath. Oops! They are not buttons at all, they are icons! This mistake is commonly seen in application icons. Clearly the first thing that comes to mind when working on an application icon is to adapt the application’s logo. What is so bad about the text inside the icon? Firstly, it is directly language-related and so impedes localization. Secondly, if the icon is small, it is impossible to read the text. Thirdly, in the case of application icons, this text is repeated in the name of the application. As a rule, this problem occurs if you use a vector editor for drawing icons. In large size everything looks pretty and clear; but in reality the icons are small, and under rasterization anti-aliasing frets the objects’ borders.